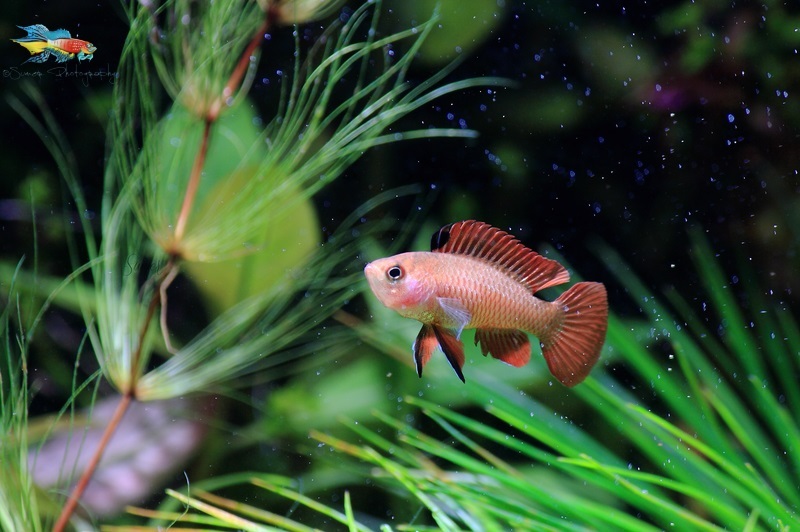 I have always had a sweet spot for the fishes that are small in size but have great personalities. I would place Dario hysginon in the Top 5 List of small species. 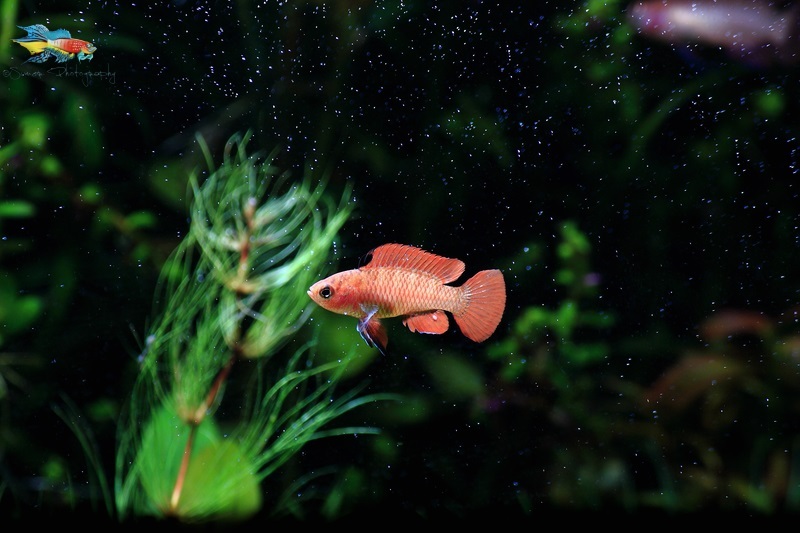 They are a true nano fish, but despite their smaller size, they have larger-than-life personalities. The whole time I had them in my tanks, I was amazed at their behavior. I watched them display temporary bond formation for breeding, aggression between the males, and rivalry between the females; it was surprising and captivating. The largest male specimen I kept grew to about 22 mm, a little more than 3/4-inch. Females tended to range between 12-17 mm. They are often called Red Melon Dario because of their bright colors. Males tend to have more intense colors than the females. The most prominent feature in this species is the extended first few dorsal fins, which have a black color blotch. They normally keep their dorsal fins contracted, opening them up when they are flaring to other fish or when they are being aggressive. Dario hysginon comes from Myanmar, where it lives in oxygen-deprived water. Just like many other bodies of water in South Asian countries, Cryptocoryne species are abundant in Dario hysginon’s habitat, too. Low oxygen levels in CO2-infused planted tanks can be a threat to many popular Cyprinids, but the ability of D. hysginon to excel in low oxygen water makes them an ideal fish for high-tech planted tanks. They tend to hide when it’s bright, so it’s important to furnish their aquarium with plenty of plant foliage. Since the males like to claim territories, plants block direct eye contact between rivals, and in this way the males’ territories can be smaller than what they would be without the plants. 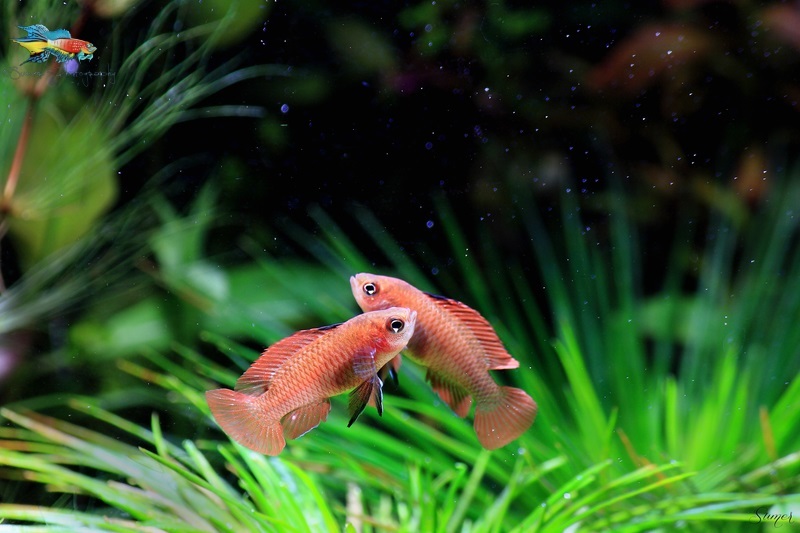 If the tank is heavily planted, up to 7 pairs can be kept in a 20-gallon aquarium. 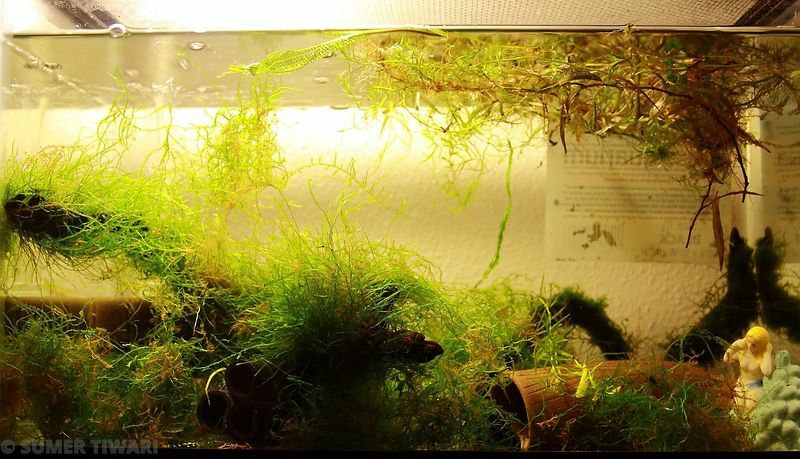 If you are looking to set up a breeding-only tank for just one pair or a trio, filling it with moss at the bottom would be a great idea. The breeding section will explain more about this. Breeding tank for Dario hysginon. There is a lot of java moss in there. Just like other fishes from the family Badidae, this species is also a micropredator. In the wild, they eat small insects, crustaceans, and zooplankton. In captivity, they are easier to feed than their cousins Dario dario. D. hysginon will accept frozen food and reportedly even pellets, although I personally did not try feeding them pellets. Since my broodstock was wild-caught, I always fed them with either live or frozen food. In my tanks, their main diet was frozen adult brine shrimp. I complemented this diet with occasional bloodworms, Grindal worms, and daphnia. Fishes from the Badidae family are prone to obesity and other diseases if fed with bloodworms and blackworms as their staple. It is one of those species that, if they get comfortable in your tank, they just keep breeding. You might have more than a dozen batches of fry going at the same time. The first step towards breeding them is to condition them. Foods that are rich in fat and protein do a great job at conditioning Dario hysginon. I found that grindal worms, white worms, bloodworms (smaller sized), and daphnia work great. Once they are conditioned, my males would start making territories. They would constantly go in and out of the plant foliage to check if another male was trying to breach their territory. Blyxa japonica was a great plant to have with them. Since it makes a thick bush, multiple males would try to make it their territory and at times, multiple males would go into the bush not knowing that other males were also in there. It was funny to watch, because one male would come out and, seeing no one, he’d go back. A few moments later, another male would come out of the same bush and see no other male outside. They all assumed that they had the whole bush to themselves, but in reality there were multiple males enjoying it. Females try to stay in an open area, which is not under any male’s territory. They usually find a spot that is comfortable to rest on. In my tank, females loved to sit on the crowns of Syngonanthus belem. When the males were ready to mate, they would go out and invite the females into their territories. The way they do it is very interesting. A male would slowly approach a female, very gently touch her with his mouth, turn around, and go towards his territory. If the female was ready and interested in the male, she followed him to his territory. If not, the male would try the same thing with another female. Once the male was joined by a willing female and felt safe, usually under some shade, he approached the female for an embrace. Just like with the spawning embrace of Bettas, the male Dario wrapped his body around the female’s, and the eggs are dropped while being fertilized by the male. Dario hysginon are egg scatterers. Neither the male nor the female seems to go after the eggs to consume them. After the embrace, the male chases away the female. He then tries to repeat the same thing with another female. The mating behavior of Dario hysginon would not be very interesting if it only consisted of the typical scripted behavior I just described. What happens when the females are more excited than the males to mate? I have seen females going into different territories and sort of forcing the males to embrace. It became even more interesting when a pair was busy embracing and a second female, who also wanted to mate with the preoccupied male, came in and very aggressively attacked the embracing pair. I was amazed at her aggression and energy, not to mention that the embracing pair was forced to separate, and the angry female chased away the other female. The male was taken aback and wasn’t in the mood for spawning with the angry female after this incident. While allowing most of my fish to spawn in the main display tank, in a concurrent experiment I also set up a breeding tank for Dario hysginon. My breeding setup consisted of a 10-gallon tank with a lot of java moss on the bottom. Since I knew they would scatter the eggs, I wanted the eggs to get lost in the moss, so that there would be very little possibility of the adults eating the eggs. I took one pair and put them in the tank. I could not see the embrace myself, but the way the female was cornered next day, I was pretty sure the embrace had been done. I took the female and the male both out of the tank. I could see fry all over the tank after 2-3 days. The experiment was a success. It took about 2-3 days for the eggs to hatch. It is very important to understand at this stage that these fry are very small. Nematodes–which are usually considered fry food, like banana worms or microworms–would not work for these fry. They need something even smaller. A 10-gallon cycled tank with a lot of moss generally had enough infusoria and paramecium to keep the fry full for the first few days. Then I switched to vinegar eels and other nematode cultures. 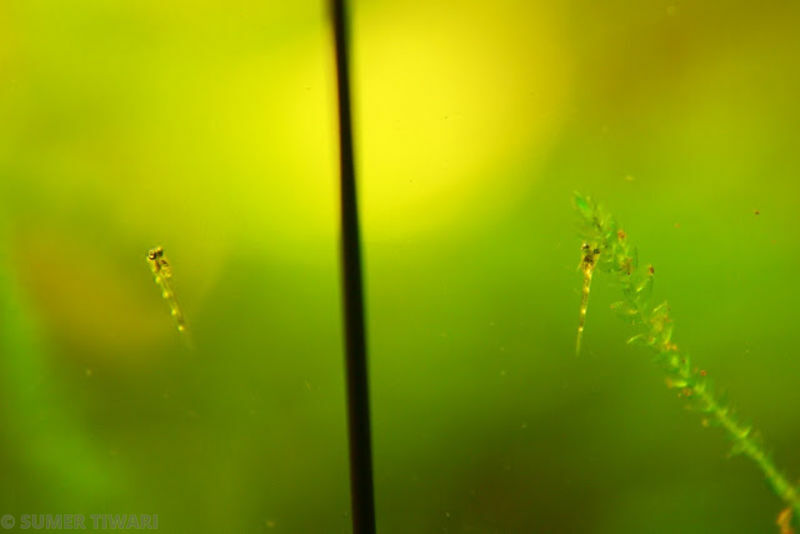 Once the fry were about 3-4 mm in size, they could easily eat freshly-hatched brine shrimp. Many times, the fry would go unnoticed in a heavily-planted tank, and I would get a surprise when doing a big trim. 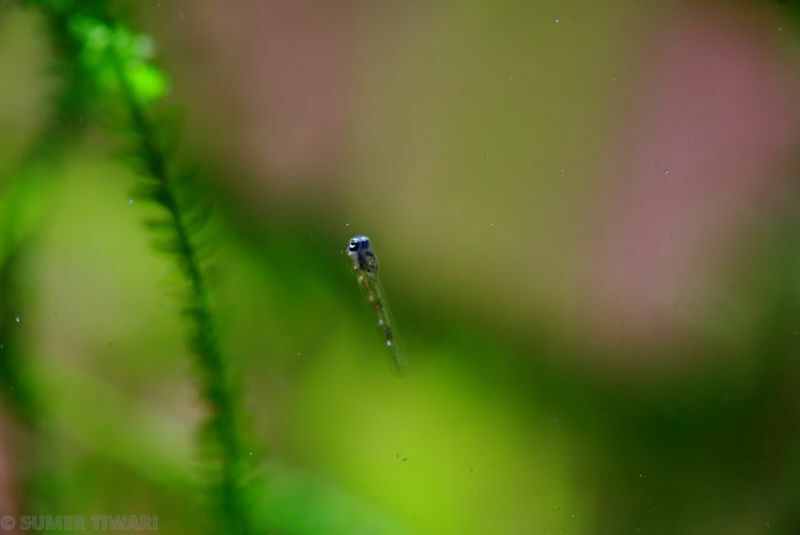 Newly-hatched Dario hysginon fry. They somehow manage to stick to a surface and keep sticking until they start free-swimming. They are shown with a 5-mm pencil lead for size reference. They seem to have black bars on their body, which adults don’t. I believe Dario hysginon is overall a great fish to observe and breed. It is challenging enough that you wouldn’t feel demotivated while keeping it, but it doesn’t have any crazy requirements that a dedicated hobbyist won’t be able to fulfill. I hope you enjoyed reading about my experiences with the Red Melon Dario. Please let me know your thoughts and questions in the comments below. Hello there! I am setting up a 5 gallon heavily planted tank, and am strongly considering a Dario sp (such as this one, which I’ve heard is the least exacting of the bunch). You said 7 pairs would work in a 20 gallon…would 2 or 3 pairs work in a sufficiently planted standard 5? Thankx for your replies! 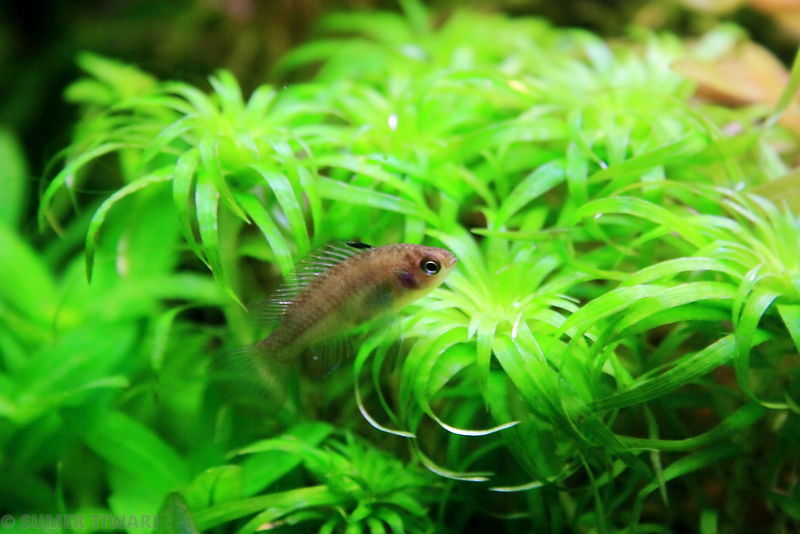 As I mentioned in the article, Blyxa japonica is a great plant to make dense foliage for this species to hide in. Rachel at Msjikzd.com offers these for sale. That is where I got mine from. I’ve have a heavily planted 8 gallon that I want to add Dario Hysginon to. Lately it’s been impossible to find these. Any suggestions on where to get these? Hi Josh, A 5 gallon should be able to handle up to 2 pairs I would suggest. More than that might spura bloodshed ;) As I mentioned in the article, Blyxa japonica is a great plant to make dense foliage for this species to hide in. Rachel at Msjikzd.com offers these for sale. That is where I got mine from. Hello there! I am setting up a 5 gallon heavily planted tank, and am strongly considering a Dario sp (such as this one, which I've heard is the least exacting of the bunch). You said 7 pairs would work in a 20 gallon...would 2 or 3 pairs work in a sufficiently planted standard 5? Thankx for your replies!